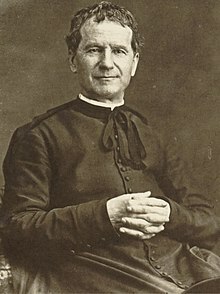 Saint John Bosco @ Torino, 1880 Priest, Confessor, Founder, "Father and Teacher of Youth"
Sant John Bosco zaun asa ek Roman Katolik sant. To 19vea xekdean ek Italicho padri aslo. Tennem aplea jivitant gorib and rostad bhurgeanche udogoti ani xikopache khatir khup vavr kelo. Tannem Salesians of Don Bosco padricho ordr, Daughters of Mary Help of Christians, hi madrinchi ordr, ani Salesian Cooperators, ho sadhea lokancho zomo suru kele.